Jace and Clary go out on their first real date in the 'Shadowhunters' Season 3. Series creator Todd Slavkin confirmed in a previous interview that Jace Herondale and Clary Fairchild will go on a mundane date in the “Shadowhunters” season 3. Now we may have our first look at this date in recently leaked behind-the-scenes photos. 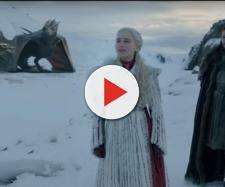 A couple of images said to be from the filming of the upcoming season have leaked on social media. Instagram user Shadowhunters_news shared the photos that show Jace (Dominic Sherwood) and Clary (Katherine McNamara) out on a date. Although the shots are a little blurry, we can still make out what appears to be Clary’s red hair walking beside someone in black, who we can assume is Jace, judging from the color of the person’s hair. However, they are not alone. It turns out to be a double date. Maia (Alisha Wainwright) and Simon (Alberto Rosende) are with them too. No one would miss that thick curly hair of Maia’s and Simon’s signature black jacket. We can also make out a silhouette of the Daylighter’s face. Twitter user Van_SH Spoilers also shared one BTS photo and a video. A short clip from the said date also surfaced on Twitter. We can see Jace and Clary walking and Jace removes his jacket. Meanwhile, Maia and Simon stood behind. Perhaps this scene is from Episode 1. It is unknown if this scene will make it into the final cut. However, this further confirms that “Shadowhunters” Season 3 has started filming. Production for the installment officially started on August 21, according to a list of filming schedules listed in Actra Toronto’s website. Filming for the new season is expected to end on May 18, 2018. The casts and crew returned to Canada for the production. Likewise, McNamara confirmed the start filming with a behind-the-scenes photo. The photos and video emerged after showrunner Todd Slavkin confirmed that the Shadowhunters will go out on a date in Season 3. In response to a fan’s request, the creator revealed that Jace and Clary will go on a “mundane date” so they could get to know each other better. We just hope that Simon and Maia would not tag along for the entirety of this date. Otherwise, it would be awkward knowing that Simon used to pine for his best friend and Maia slept with Jace. Freeform has yet to announce the official air date for the new season. However, the odds are it will be in January 2018. This is usually when new seasons of the series come out, just like what happened with Season 1 and 2.